July 2015 Another Season ends………. Well, we aim to please! Certainly the period from April to July was non-stop: Two performances of Mozart’s Requiem, a tour to Suffolk to perform a repertoire of light music with the Stour Valley Singers, and a concert of light and humorous pieces to end the season. The Summer will provide a well-earned break as the 2015-16 season looks equally hectic with Concerts in Llanfair on 14th November and Clun Memorial Hall on 21st November, Evensong at St David’s Cathedral in February and one other Cathedral (yet to be confirmed), the possibility of a choir CD of well-known and well-loved Christmas Carols, the round of Christmas Services and concerts and then the Easter performances of a Requiem…………………….. may be the choir should turn professional! It is somewhat embarrassing to realise that we are in August and that there has been no update to the news section since December. The reason however, is the right one – the choir has just been too busy! Apologies to previously avid readers…. 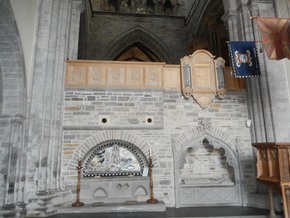 Once the joyous round of Christmas services and concerts were completed the choir awaited confirmation of their invitation to sing Choral Matins and Evensong at St David’s Cathedral whilst rehearsing for other concerts and services. When confirmation was finally received there was a sharp intake of breath - we would be singing on the first Sunday in Lent which requires a different order of service and thus new music had to be ordered……unrehearsed and indeed, previously unseen, music! Intensive rehear sing took place in a very short space of time; travel arrangements were made; hotels booked; routes checked and weather forecasts re-checked (this was February!). The day dawned and the choir had a thoroughly enjoyable time. The highlight for many being the Evensong rendition of Crux Fidelis sung a capella from the side chapel producing the most wonderful and magical sound within the body of the Cathedral itself. There was no time to celebrate, however as rehearsals for a packed programme of performances and recordings continued apace starting with a charity fundraising performance in Presteigne in aid of the Knighton Food Bank which serves residents of both Knighton and Presteigne. The concert raised over £350. This is not the first time that the choir has given a performance specifically for the food bank and it will undoubtedly not be the last; it has helped to raise over £1200 thus far for this charity. The support of local and not so local residents at the many choir fundraising events is always appreciated by both the choir and the many charities supported. Indeed, there are two more fund raising performances taking place this year - November 26th in Clun Community Hall and Dec 3rd in the Everest Hall, Llanfair Waterdine which will involve a wide range of musical styles and periods – and will be guaranteed to be fun and enjoyable! Hot on the heels of Presteigne the choir were singing services in Malvern Priory, Bath Abbey and Hopesay Church. It has to be said that the hospitality shown to the choir by the congregation of Hopesay following Evensong was second to none – waistbands certainly expanded that evening! It was a great privilege and joy to be invited to sing at the Mayor of Knighton’s Civic Service. It was also great fun to be invited to sing at The Turbary for the Llanfair Waterdine Conservation Trust, a group who have generously supported the choir when spreading the reputat ion of Llanfair further afield. 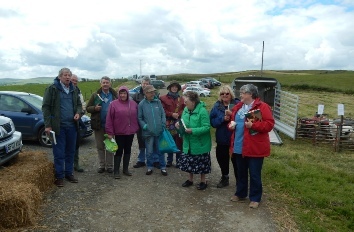 Some of the pictures of a select group of singers huddled together in waterproofs singing a capella to the assembled crowd (including sheep) gives a flavour of the event! 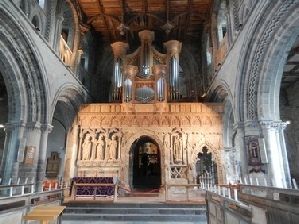 Just seven days later, thirty of us were enjoying the hospitality of Llangunllo as we sang for their Patronal Festival. As we can reflect upon an excellent summer - not just the weather but the singing, the partying and the relaxation! Now that September is here and we prepare to start the new choir year, (new members always welcome - particularly basses at the moment!) we're gearing up for the full schedule ahead of us on our Calendar Page. And looking even further ahead; no year would be complete without an invitation to sing evensong at a Cathedral - this time Lichfield, next May. We look forward to seeing you at any or all of these events and, if you are interested in singing and wish to join us, please e-mail the membership Secretary, Di Cosgrove, via the link on the committee page of this website.. It would be remiss not to record our huge thanks, as always, to Llanfair's Director of Music (DoM) Graham Trew, who always bears the "heat and burden" of these events but who, this time, found himself in the role of DoM for both choirs and coped with the added pressure in his usual unflappable style. 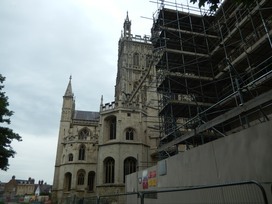 Our year officially ended with the singing of choral evensong at Gloucester Cathedral in June. Gloucester is a beautiful cathedral with lovely acoustics but, if you don't know the city well, then it can be a challenge to find because no-one has thought about sign- posting it! "Ah," you say, "Can't possibly miss a Cathedral - big building, obvious from miles around" Well, not if it is surrounded by even higher buildings which obscure it from street level! None the less, with the challenge of both finding the car parks and the Cathedral over, we were able to enjoy providing the congregation with a wonderful service including the very exciting set of modern responses composed by Gabriel Jackson. Somewhat to our surprise, Gloucester appeared to follow the example of Welsh Cathedrals rather than English ones in that it was unable to offer a cup of tea for a thirsty choir after the service. Those of you who read this column regularly will appreciate the importance of refreshments to this choir! One thing that can be said about being in the Llanfair singers is that life is never dull! The run up to the summer break was as hectic as ever, embracing rehearsals, concerts, celebrations, joy and moments of sadness in equal measure. It was with a great deal sadness that we learnt of the death of our much loved and larger than life second bass, John Wilde, whose presence is seriously missed. Our thoughts were very much with his wife Carolyn, and we are delighted that she has remained amongst us and continues to play such a vital part in the choir both as a singer and as our key administrator. We had the opportunity to acknowledge the tragic death of former member Richard Wood, and were able to provide our own contribution to the celebration of his life. Rehearsals were at fever pitch as we prepared for our biennial joint concert with the Stour Valley Singers which took place on Saturday 13th May at St Edward's Church Hall, Knighton, in front of a wonderful and enthusiastic audience. The programme included secular and religious music ranging from Lennon and McCartney and Abba to Rachmaninov and Bruckner (and a recording is available for those who wish to purchase one - with proceeds to choir funds.......) Needless to say that the evening was rounded off with wine and nibbles. A Grand “Grand” Thank you! 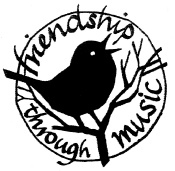 A huge thank you to everyone who supported our winter concerts. Your support for the Everest Hall Charity concert enabled us to present a cheque for over £1000 to the Guide Dogs for the Blind Association. A fantastic amount to have raised from such an enjoyable evening. Thank you. We are now back in harness readying ourselves for the challenges of a New Year. Amongst the more unexpected challenges awaiting us has been the need to sing in Russian, Welsh, French and Latin along with the one that we can all manage… English; mercifully not all languages at the same time! Llanfair singers are a talented lot and, fortunately there are several linguist in the choir, however, there is a vacancy for a Russian speaker – ideally a bass if anyone is interested?! Our attempts at Welsh were on display on March 4th as we helped lead the singing for the St David’s Day celebrations which, this year, took place in the Drill Hall in Knighton whilst the Community Centre is being upgraded. It definitely boosted the ego to see us described as “the highlight of the occasion” on Facebook! 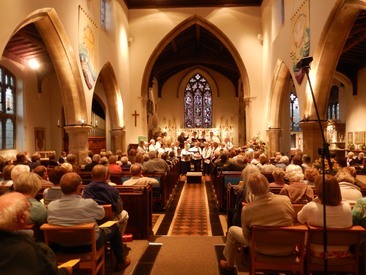 Our other multi-lingual demonstrations will be in evidence on Saturday 13th May when, once again, we join with our friends, The Stour Valley Singers for our biennial concert – this time held in the warmth of St Edward’s Church Hall. This is always a wonderful evening of predominantly light music with the two choirs singing their own repertoires with a few joint items. As always, we look forward to seeing as many of you as possible joining us for the evening. No Llanfair Singers’ programme is ever complete without at least one Cathedral Evensong, this time at Gloucester Cathedral on Friday 2nd June. We look forward to seeing some Llanfair supporters amongst the congregation. This year’s concert season got off to a wonderful start at the beginning of November in Clun Memorial Hall where we had a reasonably sized and very appreciative audience. There was a varied programme of light music, sacred anthems and part songs and a couple of surprises. Mig’s Band, our small local ‘Orchestra’ comprising violin, clarinet, two flutes, a cello and a piano played Elgar, Dvorak, Offenbach and Rossini, making a very good impression for such a tiny orchestra. Our next concert; a similar programme, but with some key differences will be on November 25th in the Everest Hall, Llanfair Waterdine. There will be a supper for ticket holders afterwards in good Llanfair Waterdine fashion! Please book your tickets as soon as possible so we have some idea of how many people to cater for. Thank you and see you there! !